Elizabeth Nyumi Nungurrayi was born in the bush near Jupiter Well. 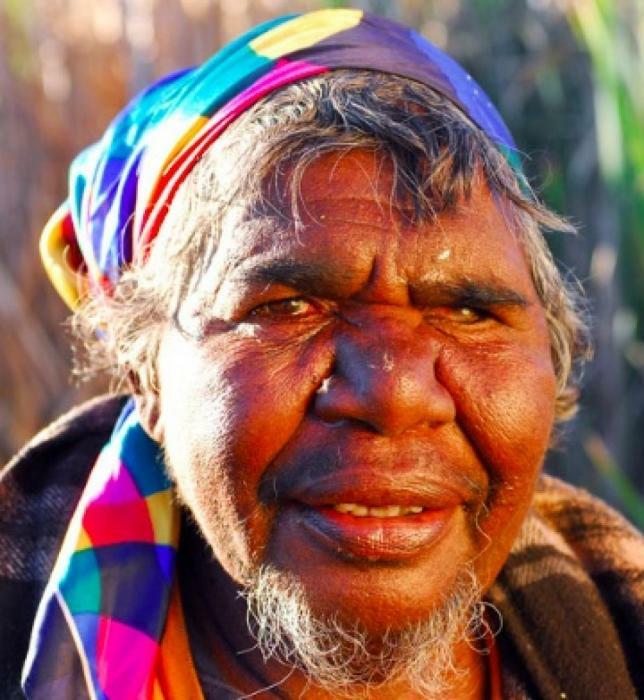 Nyumi's mother belonged to the country of Nynmi near Kiwirrkurra on the Pintupi side. Her father was from Alyarra in the region of the Ngaanyatjarra people. Nyumi commenced painting in 1987 and emerged as a leading artist in the late 1990s. She is married to the artist Palmer Gordon and has four daughters, three of whom are still living and beginning to paint with strong encouragement from Nyumi. Her elder brothers Brandy Tjungurrayi and Patrick Olodoodi are both senior lawmen and recognised artists. Nyumi is a very strong culture woman and dancer and an enthusiastic teacher of culture to children, ensuring the traditional dances and songs are kept alive. Nyumi's paintings are mainly concerned with the abundant bush food in the country belonging to her family. Initially, she worked with a thick brush, covering the canvas with fluent lines in tones of yellow, green and red. She has now developed a strong personal style of thick impasto dotting, to build up fields of texture heavily laden with white, in which motifs of camp sites, coolamons, digging sticks and bush tucker stand out. Nyumi held her first solo exhibition Parwalla at Raft Artspace in 2001. A closely associated painting to Parwalla, 2001, by the same title, painted in the same year, was selected for the 2004 Biennale of Sydney. Together with two other works by Nyumi, it was shown at the Museum of Contemporary Art as part of a large international group exhibition. In the accompanying catalogue essay, Hetti Perkins defines this as ‘the most resolved series of paintings in her ongoing preoccupation with the country of her childhood’.1 Indeed, this work exemplifies the physical and spiritual connection of the artist to her country, in a symbiotic relationship that informs the entirety of Nyumi’s artistic output. Parwalla is the country where Nyumi lived as a child with her mother, before losing her in a tragic accident. After this, Nyumi led a nomadic existence with her father and family group, ultimately settling in the Wirrimanu community at Balgo, where she commenced painting in 1987 for the Warlayirti Artists cooperative. The symbols depicted in Nyumi’s works are inherently feminine. She represents campsites, bush tucker, native flora and fauna and women’s food-gathering implements. These themes are rendered in a delicate, jewel-like style and soft palette of pastel yellows, oranges, pinks and creams, removed from the vigorous, painterly style and bright colours idiosyncratic to Balgo. Perkins highlights the influence of Nyumi’s matrilineal Pintupi heritage, and associates her with that extraordinary generation of desert women artists, beginning in the 1980s with Emily Kame Kngwarreye, followed by Pintupi artists at Kintore and Kiwirrkurra and spectacularly reinvented by the women artists at Warlayirti. 2013 Seoul Open Arts Fair, Korea. (Group Exhibition via Desart, Alice Springs.